The colonial center of Quito is a treasure trove of baroque art and architecture, including state buildings, churches, monasteries and narrow streets that reflect Ecuador's unique blend of indigenous and Spanish cultures. The Hotel Plaza Grande is located in what was originally the home of Juan Díaz de Hidalgo, one of the Spanish conquerors who founded the city of Quito at the beginning of the sixteenth century. He was later appointed Quito's first judge. 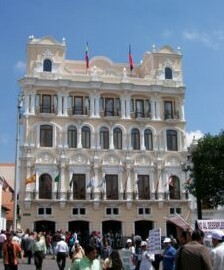 His mansion later became one of Quito's first hotels. Previously known as the Majestic Hotel, its doors first opened in 1943. The hotel was renowned for its elegance, music and color, delighting thousands of guests and becoming one of the biggest attractions of the era. The hotel closed its doors, but the building remained in service, first as a bank and then as administrative offices for the municipality of Quito. In 2005, however, the building caught the attention of a group of hoteliers, who began an investment to restore the old hotel to its former glory. Today, the boutique Hotel Plaza Grande is Quito's finest hotel. This is a full-service hotel with 24-hour room service, Spa and Fitness Center, and three restaurants: The Café Plaza Grande, La Belle Epoque for more formal dining, and the El Claustro Wine Cellar. Hotel Plaza Grande has 15 suites, furnished with antique pieces or highest quality reproductions, and following standards of the Spanish colonial era. The suites combine the flavor of long-ago times with every detail that a modern five star hotel could require. There are eleven double and single Royal Suites, each of which has been outfitted with tasteful décor and fine linens for an unforgettable visit. The three Plaza Suites feature an incomparable view of the Plaza de Independencia Square, the Panecillo Hill, Cathedral and Presidential Palace that will take you back centuries.